Aposematism is unusual in herbivorous mammals, and exceptions help clarify its ecology and evolution. The Norwegian lemming differs from other rodents in colouration and behaviour. One hypothesis is that its black, yellow and white colours, loud calls and ferocious defence reduce predation by conspicuous aposematism. Another hypothesis is that the colouration is cryptic. These alternatives are tested in a detectability experiment comparing lemmings and sympatric grey-sided voles. All 18 observers detected a higher proportion of the lemmings, corroborating conspicuousness. Unlike smaller rodents, Norwegian lemmings often call from a distance at predators. The aposematism hypothesis predicts that cryptically coloured Alaskan brown lemmings will not call. In the field, Norwegian lemmings gave antipredator calls at a human observer in 36 of 110 encounters, but brown lemmings did so in only 1 of 39 cases. Most Norwegian lemmings called if surprised within a few metres but froze or fled silently farther away, relying on crypsis against distant predators. Small juveniles called as often as adults, a possible case of auto-mimicry. In an earlier experiment, Norwegian lemmings, in contrast with grey-sided voles, aggressively resisted attacks by a major avian predator of rodents. 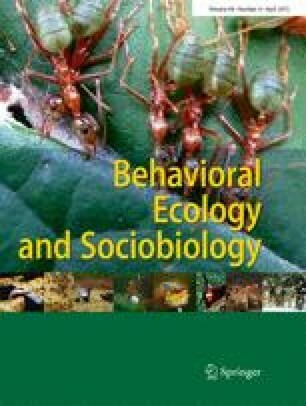 The tests corroborate the hypotheses that (1) distinctive, contrast-rich colouration, antipredator calls and threat postures of the Norwegian lemming form a multimodal suit of aposematic traits, warning predators that this is a more dangerous prey than the smaller sympatric voles, and (2) discriminability from undefended species is an important adaptive reason for conspicuous distinctness of many aposematic signals. The online version of this article (doi: 10.1007/s00265-014-1868-7) contains supplementary material, which is available to authorized users. I thank the Swedish Research Council, Christer Jonasson and the Abisko Scientific Research Station for research grants, and the Naval Arctic Research Laboratory, Barrow, Alaska, for fieldwork facilities. I am grateful to my field companions, in particular Sven Jonasson and Jan Uddén; to Nils Åke Andersson, Anders Angerbjörn, Lars Baer, Sven Jakobsson, Heikki Henttonen, Birger Hörnfeldt and Johan Wallander for information about lemming abundance; to Staffan Andersson, Donald Blomqvist and Gabriella Gamberale-Stille for helpful discussions; to Anders Angerbjörn, Tim Caro, Alecia Carter, Frank Götmark, Rolf Ims, Sami Merilaita, Joacim Näslund, Birgitta Tullberg and anonymous referees for constructive suggestions on the manuscript; and to Peter Myers and Larry Underwood for valuable help at Barrow. Alexander Rydén kindly provided the video clip of a Norwegian lemming. The Abisko experiment was kindly made possible with short notice by Urban Emanuelsson and his biology student group. The work complies with the laws of the country in which they were performed. To measure my step length and its precision, I counted steps to each of 50 targets in heath habitat, also measuring each distance to the nearest 0.1 m with a tape. The average step length, 0.80 m, was obtained as the sum of distances (722.4 m) divided by the sum of steps (902). One way of checking the precision (relative or fractional uncertainty, Taylor 1997) and consistency of the step-based estimate is plotting it against the distance measured by tape (Fig. 4). With its higher precision (usually less than 1 % error), the tape measure is here used as the real distance with which to compare the less accurate step-based estimate (see Taylor 1997). Taking the absolute value of the difference between a tape measurement and the corresponding step-based estimate, and dividing by the tape measurement, gives the relative error of the step-based estimate. The 50 distances thus estimated to the nearest m (number of steps x 0.8) differed on average by 6.3 % from the tape measurements (see Fig. 4). The step-based measure is therefore adequate for exploring the distance trend in lemming calls at encounters, which spans a range of 0–38 m (Fig. 2). Further support for the step-based measure is a test in Alaskan coastal tundra, counting my steps 5 times along a 100-m distance measured by tape, giving an average of 124.6 steps (SD = 0.9), i.e. a step length of 0.80 m. Although the identity with the step length estimated here is a coincidence, the similarity supports the usefulness in the wild of a step-based distance measure (which may of course vary between individuals and habitats, owing to differences in e.g. stature and topography).